It was an honor to be invited to assist in the celebration of Middlebury College’s 50th anniversary of its Environmental Studies Program by doing the following two projects on October 1st and 2nd. It is the oldest Environmental Studies Program of any college in this country. “Hot and Cold” is the latest iteration of a body of work that is responding to climate change. How is our civilization dealing with climate change? Perhaps “Hot and Cold” is a good way of thinking about it. Making climate change a political issue and then denying that it is currently being caused by our actions is one way some people are choosing to live with this question. Conversely many others are starting to reconsider everything, from the way we grow food, to where we live, to national security and indeed all systems that sustain life as we know it. It is with this latter train of thought that I am aligned and out of which this project grows. Here are some of the questions this piece is meditating on: Do we adapt to the changes? Will we mitigate by taking radical actions and succeed in averting a total disaster? How attached are we to the status quo? Can we live without wildness? What are we leaving for others? How do we address the suffering of most of the world’s people and living things? Will technology save us? Can we make sustainability fun? I chose the complements orange (hot) and blue (cold) because they are opposites on the color wheel. The tension of a hot orb surrounding a cold and defined, but diffuse core is intended to be alarming and – like a target – catches our attention. I am using saplings, plywood, and dimensional lumber because I am attracted to the accessibility of these materials. The organic lines of the saplings are a feature I find particularly interesting. I like how each sapling is unique yet as a whole the ensemble reads as a precise circle. I have been using saplings in my pieces because they are a renewable material. These saplings are striped or moose maple. They came from a friend’s land that appreciated the thinning I did in selecting them. The “Hope Wheels” are a simple way for folks to express what they love about what exists here and now. Perhaps by taking time to think about what one holds most dear, there is a chance that someone may be called to fight for the survival of that thing. 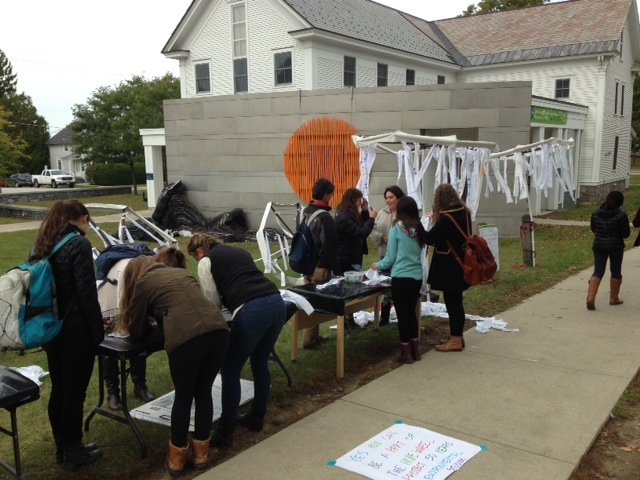 Passersby – including many Middlebury students, faculty, staff and community members – were invited to write or draw on these strips of cloth the names of animals, plants, habitats, cultures, ecosystems, bodies of water, land forms, seasonal features, loved ones, shelter, food, heath, or anything else they valued about the community of life. In the same way that Buddhist Prayer Wheels spin prayers and good thoughts over the land, these Hope Wheels can be used in a similar way. They also can be used as processional elements in demonstrations or celebrations. “Having Jay on campus for two days was tremendous for Middlebury. The participatory art – Hope Wheels – created a coming together of students, faculty, staff and townspeople in a social and celebratory way. Those who created banners of gratitude for the Wheels were clearly having fun and being thoughtful and thankful at the same time. Jay’s brightly colored sapling sculpture, Hot and Cold, which now hangs on the wall of our Franklin Environmental Studies building is strikingly beautiful and is loved by everyone I have spoken with. It fits the space perfectly, complements the wall and the surroundings, and adds color, texture and shapes that draw in the viewer. I see many people stop to enjoy and consider the artwork as they are passing by. “I love Hot and Cold because I feel like it adds light and color to an otherwise pretty banal wall. I’ve had a lot of people come tell me that they hope it is a permanent installation because it looks so beautiful – especially when the light hits it in the evening and the orange looks more brilliant than ever. 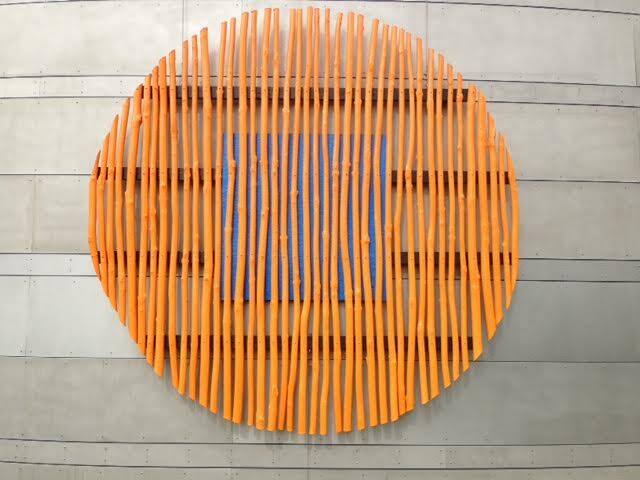 I also notice that it complements the other art installation on that wall (the one of hills of recycled tires) and to me they come together to be like the mountains and the setting sun. “I have actually heard from a lot of students that they love Hot and Cold and think that its color brings a lot of energy to the campus in a spot that so many students pass by each day. Personally, it brought me a lot of grounding energy the other day when I walked by it on a grey, dreary day. 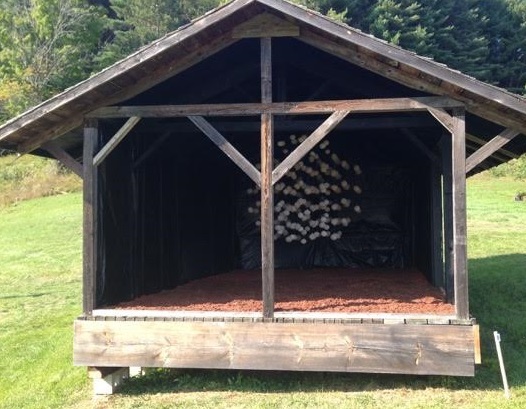 I think that the ephemerality of the piece, being made of saplings, is so fitting to the environmental studies program. On Saturday, June 13 we held an Opening for my ‘Core Values’ and ‘Ground Form’ installations at the Aidron Duckworth Museum in Meriden, New Hampshire. For me, the piece was a meditation on our society’s inaction on climate change, as well as a meditation on color and form. It was gratifying to have some 50 people attend the event. Many thanks to Museum Trustee Grace W. Harde for having made the event possible and to Colleen Bozuwa for having produced the above video of the Opening. I am equally grateful to Tracy Penfield and Lucia Gagliardone who offered an improvised dance performance among the installations. The dance was conducted in silence to focus our attention on the piece in that moment. So we all heard birds, car alarms and the occasional motorcycle. It was wonderful to see the piece surrounded by people responding to the color and forms through dance, a child climbing, people throwing frisbees and others engaged in quiet contemplation. I don’t consider myself artistic. For me art is a new way of thinking about things that are foreign to me. It’s just a cool way of thinking about things. My perception of artists is that they have a need to express themselves. What I get out of it is another perspective that is new and different and appreciated. It leaves me in awe because I don’t do that naturally. How wonderful, Jay! I loved the colors, the shapes, the way they relate to one another, the grace of the dancers, the green setting… The whole presentation calls up a peaceful, thought-provoking mindset. Thank you for sharing your work with us. 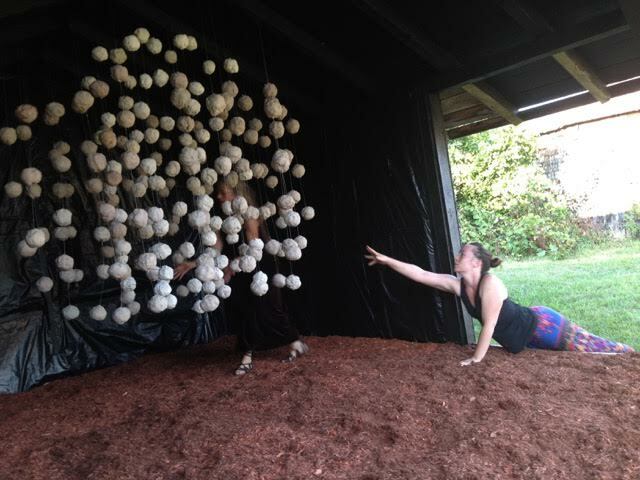 At SculptureFest annual openings, dancers engage creatively with each piece that has been installed. In this clip, Tracey Penfield and dance partner Chelsea Palin performed a spontaneous piece in “The Forest Within.” Filmed by Edie Farwell and edited by Cedar Farwell, with original music, “Anna’s Waltz,” by Seth Houston. 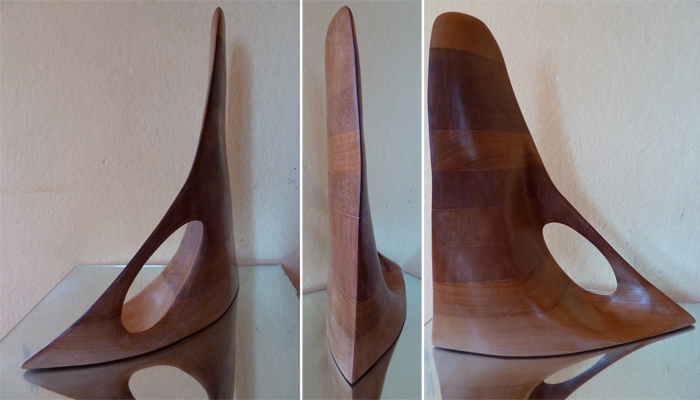 Here is my latest sculpture it is called “Wind Form.” It is laminated mahogany (scraps from mom’s stool). “Wind Form” refers to the sail like shape of the piece. 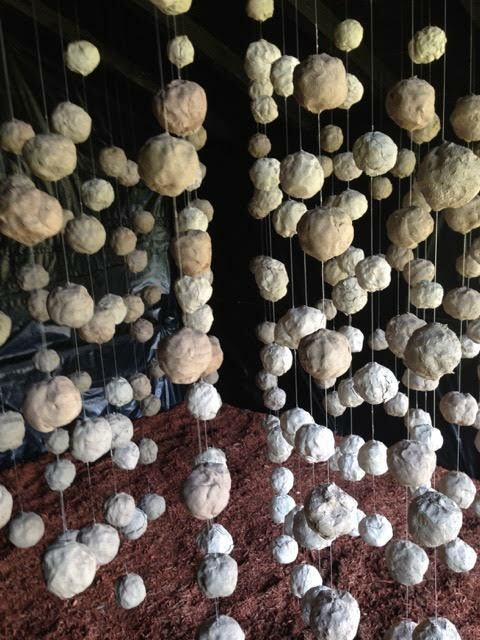 It also is reminiscent of desert rock formations that have been shaped by wind and water.